The biggest problem with immigration is the common misperception that it is a problem. But shifting unduly negative perceptions requires more than simply presenting the facts. 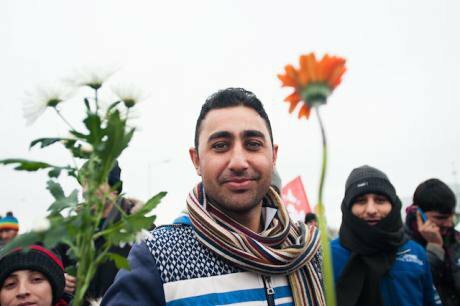 A refugee holds up flowers to the welcome march in solidarity with the refugees residing in the jungle of Calais. January, 2016. Sadones Frederik/Press Association. All rights reserved.The overwhelming weight of evidence suggests that immigration is generally a good thing – for the societies that receive talented, hard-working and diverse newcomers, not to mention for migrants themselves. Yet public perceptions of migration are often much more negative. How, then, should this chasm between perceptions and evidence be addressed? The charge sheet against immigrants is wearily familiar. They stand accused of stealing locals’ jobs and depressing their wages, burdening the state and public services, causing crime and terrorism, and much else. But while some immigrants do bad things (as do some locals), these charges are largely unsubstantiated. On the contrary, migrants tend to contribute to society by filling jobs that not enough locals want to do or can do, while their diversity and dynamism tend to boost creativity, innovation and enterprise. One response is to claim that the data fails to reflect voters’ lived experience and that people’s first-hand perceptions are surely more accurate than dry statistics and aloof academic analysis. Yet a subjective interpretation of an anecdote – an unemployed local builder sees a Polish one working and blames the immigrant for his lack of a job – is scarcely rigorous evidence. Indeed, negative perceptions of immigration are often not based on personal experience. It is telling that while few people in Britain think immigration is negative for them personally, many believe it is detrimental to the country as a whole. And in both the UK and the US attitudes towards migration are often much more negative in areas where there are few or no migrants than in areas where there are many. Mediated misperceptions are even less credible than first-hand ones. Misperceptions – who needs them? If one accepts that the evidence – albeit inevitably imperfect and incomplete – is more accurate than perceptions, then the question is what to do about the misperceptions. Unduly negative perceptions about immigration may be due to ignorance, misinformation, misinterpretation or prejudice. They are exacerbated by the fear-mongering, xenophobic rhetoric and outright lies of unscrupulous politicians, anti-immigrant campaigners and media propagandists. And they are validated by governments that often find it convenient to blame migrants for their own failings. Some people argue that in politics perceptions are everything and that even well-meaning politicians and campaigners must accept many voters’ incorrect perceptions about migration as a given. “Voters are always right. Even when they’re wrong, they’re right,” as one political strategist puts it. But it is neither right nor effective for politicians to pander to people’s misperceptions and prejudices. If people wrongly believe that their long wait to see a doctor is due to immigrants even though migrants are in fact net contributors to public finances and disproportionately medical-care providers, it is neither fair to migrants nor helpful to voters to validate their mistaken view. Centre-left or centre-right politicians who echo the lines of the far-right don’t defeat it, they become it. The claim that such pandering is nonetheless necessary to ward off the far-right is wrong-headed. Anti-immigrant prejudice isn’t acceptable simply because it comes from a “mainstream” politician. Centre-left or centre-right politicians who echo the lines of the far-right don’t defeat it, they become it. Indeed, far from dissuading voters from backing far-right parties, such pandering often encourages them to vote for the real thing. It is vital that instead of validating misperceptions and lies, politicians, campaigners and commentators put a positive, evidence-based case for immigration. They need to dispel ignorance and misinformation with information, misinterpretation with explanation, and confront prejudice head on. For instance, people typically think the immigration share of the population is much higher than it really it is; better information can help. Many people believe it is common sense that every job filled by a migrant is one less for locals; one can explain that there isn’t a fixed number of jobs to go around and migrants also create jobs when they spend their wages and in complementary lines of work. When Donald Trump slurs Muslim refugees as would-be terrorists, it can be pointed out that no American has been killed by Islamist terrorists who arrived in the US as refugees. At the same time, facts are not enough to persuade everyone – especially since many people have lost faith in experts since the financial crisis and dismiss or ignore those who make sober, fact-based arguments that challenge their views. So politicians, campaigners and commentators also need to tell emotionally compelling stories that resonate with different voters, reclaim some of the language and values that the enemies of open societies have seized as their own, and put forward policies to address the very real problems of angry and anxious voters who incorrectly blame their plight on immigrants. Compelling stories take many forms. They can be overarching narratives about how people born into a community and those who have chosen to join it can work together for the common good, illustrated by personal stories about immigrant nurses providing care to elderly locals. The most compelling stories are sometimes visual. The image of Aylan Kurdi, the Syrian toddler who washed up dead on a Turkish beach in 2015, produced an outpouring of empathy for refugees that for a while trumped xenophobia. The most compelling stories are sometimes visual. Stories need to be accompanied with an attempt to reach out to those with different values and to speak their language. In his book The Righteous Mind, Jonathan Haidt, a social psychologist at New York University, argues that liberal westerners suffer from a rationalist delusion that reasoning can cause good behaviour and is our pathway to moral truth. Yet in practice, he writes, most of our conscious reasoning is after-the-fact justification for our moral intuitions, which shape our emotions and unconsciously govern our behaviour. It is right to make a political argument for openness to immigration on the basis of freedom, equality and justice. But some will find this unpersuasive. So one should also make the case of immigration on other grounds, such as patriotism. Reactionary nationalists and xenophobes tend to claim that they are the only true patriots and that excluding immigrants is patriotic. Since liberals and progressives often feel uncomfortable talking about patriotism, they generally surrender this political and moral ground. Yet that is a mistake, as Jack Graham argued in a recent piece for OPEN, an international think-tank that I founded to defend and advance open societies. If patriotism means wanting the best for your country, that should mean seeking to overcome the barriers that are holding it back from progress. It ought to be about imagining how much better a country can become, not harking back to an idealised past. Thus welcoming refugees is “morally commendable – a point of real national pride,” as Graham argues, and indeed many Germans feel. In the US context, emphasising how many veterans are immigrants can also sway patriotic-minded voters. Persuading people on migration is not just about narrative and framing. It also has to be about policies. Persuading people on migration is not just about narrative and framing. It also has to be about policies. Politicians need to put forward bold solutions to the many problems – such as stagnant wages, insecurity, unaffordable housing and strained public services – that are often blamed on immigrants. That would be desirable in itself. And it would help address opposition to migration that is based on identity issues as well as socio-economic ones. In many cases, opposition to immigration that is ostensibly based on race, religion and identity issues is also tied to economic and social deprivation, lost status or fears about the future. Economic pain brings distributional issues to the fore and migrants are a convenient scapegoat. So addressing the very real economic and social problems that many angry and anxious voters face and wrongly blame on immigrants can also go some way to assuaging cultural fears. For sure, some people will remain unpersuaded. Psychological studies show that people with an emotional dislike of foreigners tend to come up with pseudo-rational arguments to justify their xenophobia. Thus when immigrants are working, they are taking our jobs; when they are unemployed, they are scrounging off the state. When they are rich, they are driving prices up; when they are poor, they are driving standards down. Immigrants can’t win: they are damned if they do and damned if they don’t. We should not take some people’s xenophobic attitudes as given any more than we should accept racism and other forms of prejudice. Even so, change is possible. We should not take some people’s xenophobic attitudes as given any more than we should accept racism and other forms of prejudice, which is generally much less virulent and widespread than fifty years ago. Personal interaction also makes a huge difference, one reason why perceptions of immigrants are generally so much more positive in diverse cities where people mix. Indeed, young people who have grown up in an ethnically diverse society tend to find it normal, so there is good reason to believe that social attitudes to migration will become more positive over time.